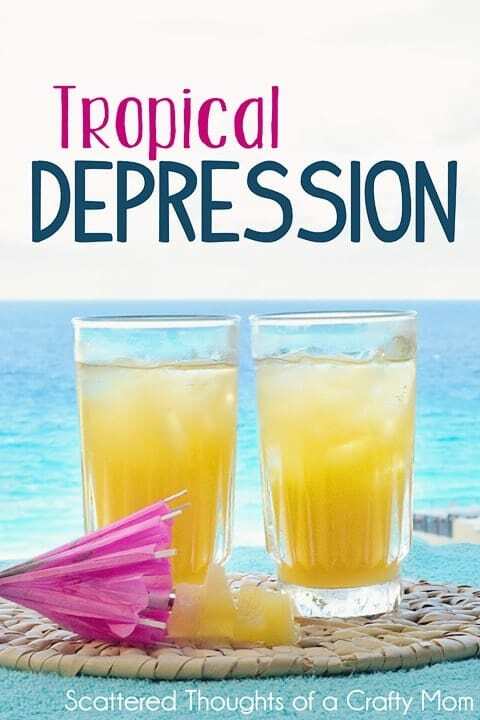 Hmm.. What a coincidence that I chose to make a drink today called “tropical depression.” Do you think I jinxed myself? Looks like we might be ending our vacation with a couple of days of clouds and rain. The thought of rain doesn’t upset me too much, we’ve had plenty of sun and I almost prefer a cloudy day over a sunny one. All the tropical sun is hard on my little guys, it makes it difficult to be down at the pool in the middle of the day. I thought this drink was quite yummy, reminded me of a screwdriver, but sweeter. (must be the pineapple juice.) Hubby didn’t like it as much, but I’m not to surprised since he prefers beer and Bloody Mary’s. 1. Fill a glass with ice cubes. Pour in vodka, then orange juice, apple juice and pineapple juice. Stir and serve. That sounds like my kind of drink. Yum!